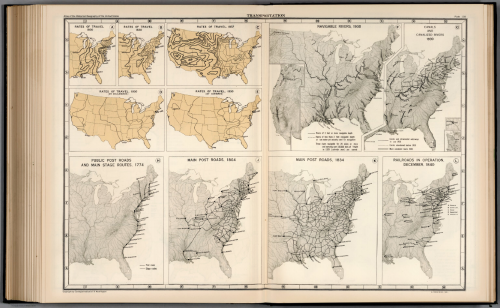 Charles O. Paullin and John K. Wright’s Atlas of the Historical Geography of the United States , first published in 1932, is an award winning work of art. A magnificent historical atlas published ahead of its time and including innovative thematic representations. Each one of the nearly 700 maps makes it a truly fantastic cartographic work. The attention to detail is exquisite and builds to a rich set of maps that detail just about every facet of America and the social, political and economic fabric of the country at that time. The purpose of an atlas is to create a collection of works that relate to the area in question and this is one of the best of the early 20th century. Its contents are curated and written by authoritive figures. The maps are combined with temporal and statistical detail and context is provided through textual explanations. This is a true compendium that expertly mixes a range of approaches to capture the history and geography of the U.S.
A new digital version has brought the atlas to a new audience and while it doesn’t necessarily portray the work as well as the original the huge benefit of being made available online is it can be seen by a much wider audience now than ever before. You can see the online version here. This entry was posted in MapCarte and tagged atlas, historical, MapCarte by @kennethfield. Bookmark the permalink.